The mother, grandmother and soon-to-be newlywed is the recipient of the college's Martin Luther King Jr., Distinguished Service Award. Dana Singleton lives by a simple mantra. We can all get along, and we can all give back. Service to others isn’t reserved for the wealthy. If you don’t have money to give, you have time or knowledge. The dean of Student Services at Tidewater Community College’s Portsmouth Campus doesn’t just talk the talk. She walks it, daily, in fact, connecting with students about their classes and concerns. Fitting that the mother, grandmother and soon-to-be newlywed is the recipient of the college’s Martin Luther King Jr., Distinguished Service Award. Singleton 58, will be recognized at a Feb. 22 ceremony at the Portsmouth Campus Student Center. The Emporia native expects her parents, Alice and Eddie Moore, brothers, Daryl and Kenneth, and her longtime soulmate, Stan Hathorn, to be in attendance. 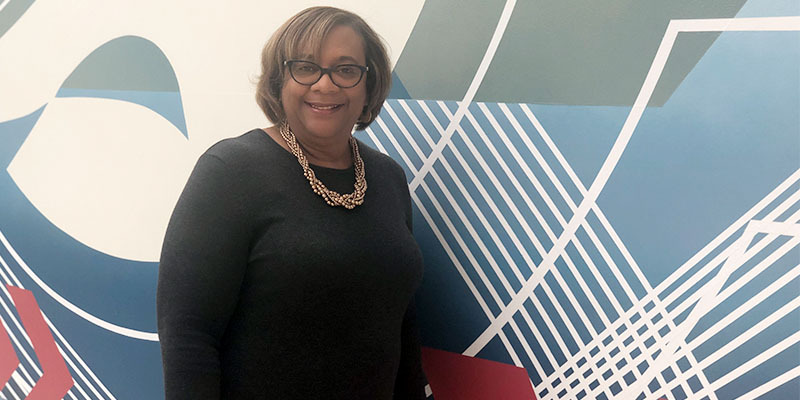 “I am so humbled and so honored,” said Singleton, who has been with the college since 2006, first as an adjunct instructor and later as a full-time administrator. Singleton said in addition to the admiration she holds for King, she is honored to join Portsmouth Provost Michelle Woodhouse and Norfolk interim Provost Emanuel Chestnut, both former winners of the TCC award. Woodhouse and Singleton are longtime friends in addition to being professional colleagues. They met when Woodhouse was assistant principal at Hugo Owens Middle School, where Singleton taught business and technology. Singleton followed Woodhouse to Norfolk State, where the pair worked together for two years, and finally to TCC, where Singleton started as an adjunct instructor and later became the inaugural coordinator of First Year Success in Portsmouth. She started the summer bridge program there, which allows incoming freshmen to earn college credit and participate in orientation during the summer. Singleton recently spearheaded “Dean’s Dynasty,” a mentorship program for female students at the Portsmouth Campus. The group meets Wednesday afternoons and tackles personal development issues, which include etiquette, health and wellness, healthy relationships and work-school balance. “After talking to so many young ladies, I realized they needed something like that,” said Singleton, who also mentors high school students as a leader in her sorority, Alpha Kappa Alpha, Inc.
Singleton earned her bachelor’s in business administration from Norfolk State and her master’s in education from Regent University. Singleton will marry Hathorn, on April 20 in Las Vegas; he will attend the Feb. 22 ceremony. She has one daughter, Codie, and a grandson, Kingston, 2. She is expecting a granddaughter in early February.